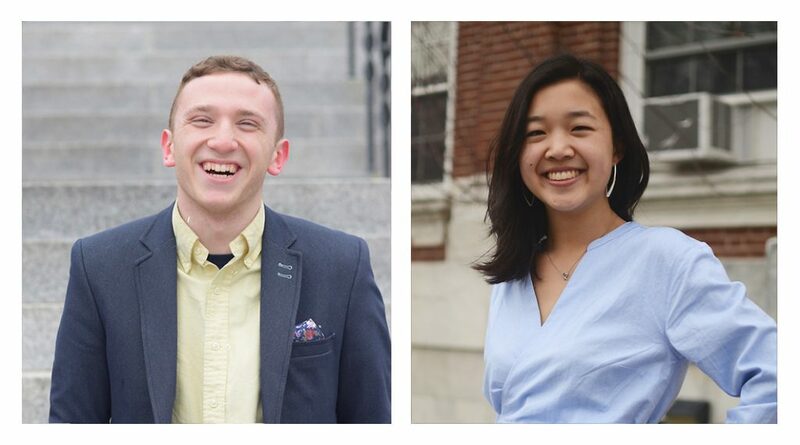 Today, Tufts students of all class years have the opportunity to cast their votes for next year’s Tufts Community Union (TCU) Senate President. Juniors Jacqueline Chen and Adam Rapfogel are running for the position. Both announced their candidacies last Thursday, April 19. Chen is currently the TCU Historian, and she has served on TCU Senate for three years. Her sophomore year, she served as the Asian American community senator and student outreach committee chair. “Being in all these different leadership positions has really shown me what a powerful body Senate can be and really driven home to me the importance of working with administrators, and oftentimes Senators are the only people who have this kind of access,” Chen said of her time on Senate. Her campaign revolves around five themes: academic opportunity, community and social spaces, dining and sustainability, student engagement and social change. Her campaign website lists a total of 31 reforms she plans to make or recent changes she vows to uphold. Additionally, Chen added that a component of her platform involves making Tufts more accessible to students from different socioeconomic backgrounds. She plans to use the research that senior and TCU Senate trustee representative Nathan Foster has been doing on the Tufts affordability metric, and she hopes to create more transparency around where the funding from increased tuition goes. Chen also said that she hopes to increase the transparency of TCU Senate, making Senate more accessible and supportive of students. She expressed her admiration of student groups on campus and her desire to create more opportunities for partnerships between Senate and these groups. While on Senate, Chen was responsible for the addition of a $10 printing stipend to every student’s JumboCash, and she also spearheaded the creation of the Swipe It Forward meal bank initiative. She has worked on projects such as opening up the Asian American Center, and this has allowed her to see the demand for social spaces on campus, according to Chen. Chen’s campaign outreach has been largely digital, with her supporters sharing her Facebook page and website, as well as changing their profile pictures to her signature “Elect Chen” frame. On April 23, Chen and her campaign supporters handed out 200 ice pops at her “Chill with Chen” event outside the Mayer Campus Center. “Campaigning has really given me an opportunity to reflect on why I have been working to improve Tufts for the past three years,” she said. Rapfogel, also running for TCU Senate President, currently serves as the TCU Parliamentarian. Like Chen, he is serving his third year on TCU Senate. Rapfogel’s platform consists of long-term reforms like making Tufts more financially accessible, fairly funding the Group of Five houses and creating an equitable method of funding student groups recognized by TCU Senate. His campaign also has five clearly defined short-term priorities: providing more funding for club sports, increasing off-campus housing accessibility, creating additional unpaid internship grants, making syllabi and course evaluations available to students before they register for classes and reforming the eight-semester residency requirement. In regards to financial accessibility, Rapfogel wants to see the tuition-setting process be opened up to more of the Tufts community, specifically students and faculty. “The Board of Trustees are largely detached from the goings-on of the university, so you have the faculty, the teachers and staff who are working here, you have the students who have the best idea of what’s going on here day to day and what students and what the campus needs, yet they aren’t really involved in any meaningful way in the tuition process,” Rapfogel said. In regards to his short-term goals, Rapfogel suggested creating an online system to give students information on the best local landlords and how to book a house for when they live off campus. He also hopes to find funding for club sports from Tufts athletics, which currently does not allocate any money to club sports, according to Rapfogel. Rapfogel’s campaign manager, Alexa Weinstein, a sophomore, said that the short-term priorities have been a key part of Rapfogel’s campaign. “What’s been really successful and we’ve found that students love is that we have these five priorities … so part of the campaign has been just going into these groups and saying, ‘we have a way to fix this, can we get you vote, can we work together on this,’ has been really exciting,” she said. As TCU Parliamentarian, Rapfogel says that the requirement to read and understand every Senate resolution has given him experience helping other members of Senate with a variety of projects, and that he has witnessed “what works and what doesn’t” when it comes to passing resolutions. As Parliamentarian, Rapfogel is prohibited from taking sides on resolutions. Speaking about his accomplishments on Senate, Rapfogel mentioned developing the Tufts app, getting the Whole Foods stop added to the Boston Avenue Shuttle schedule and increasing Senate transparency. As Parliamentarian, he instituted a policy that requires Senate resolutions to be available a week before the Senate meetings where they are discussed, while they used to be available for just a few days. “We’re just 35 people, we can’t possibly represent everyone in the student body, so as much transparency as we can get is great,” he said. Both Rapfogel and Chen expressed their gratitude to be running for TCU President, and they implored students to vote for the candidate whose policy would best reflect their needs. “Jacqueline and I are good friends, so we thought it would be a little stressful going into it, and it definitely has been not super easy — it’s never easy to run a campaign — but I’m really excited that we both really consciously decided to run a policy-focused campaign … [and] to focus on priorities and long-term goals,” Rapfogel said. Elections will take place all day today, April 26. Students, including seniors, can vote all day, according to events posted on Facebook by Rapfogel’s and Chen’s campaign pages.